If you follow my blog, you may have noticed that I am not a “dip your toe in the water and feel it out” type of teacher when it comes to new ideas. I am a jump head first into the deep end type of teacher. If you need proof, my first year of teaching I decided to jump head first into both Modeling Instruction and standards-based grading. You can check out my post about my head first dive into a ​paperless classroom​ during last school year as well. This year’s dive may be my boldest yet; a deskless classroom. 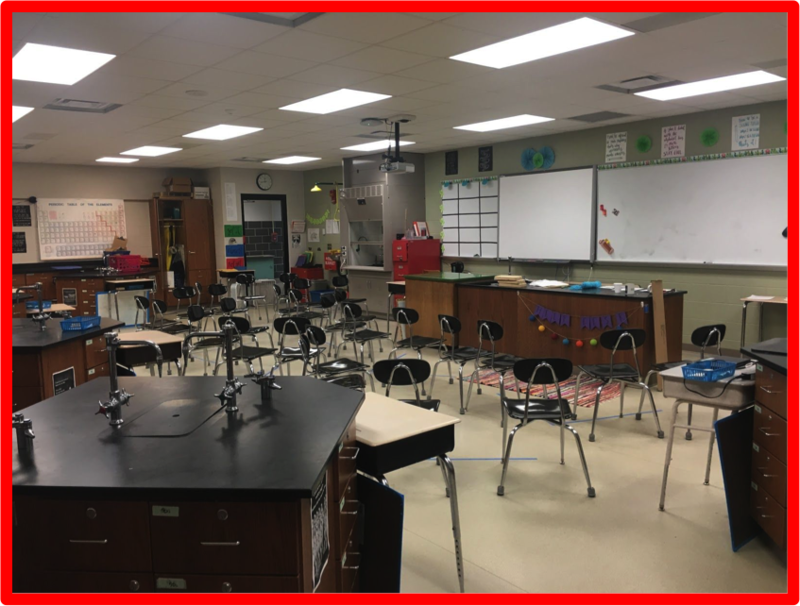 When the idea of going deskless popped into my head last spring, it was in response to classroom management and safety issues that had been arising with increased class sizes, the addition of inclusion physical science 9 to my schedule and the adoption of a 1:1 Chromebook program. It was difficult to maneuver around 28 desks and 6 built-in lab stations to actually see what students were up to. If I ever had to get across the classroom in a hurry, I would probably have to leap across the desks to do it! It was difficult to even walk around the room while students were working, especially to monitor their Chromebook screens. Most importantly, teaching inclusion classes meant I had students with a wide range of physical and cognitive needs in my class that were not fully met by my traditional classroom. It also didn’t help that my classroom, which I affectionately call the Chemistry Cave, has no windows and gets a little claustrophobic. I figured I could always add in more flexibility but it would be hard to pull back the other way. I pitched the idea to my principal, got the thumbs up and by the time I came back for the new school year, (most of) my desks were gone. Students come in, check the board, grab what they need for the day and put the rest of their things in their team’s box by their lab station. students because I can maneuver around more quickly. My students are still sitting with their teams but they are all facing the same direction. This has been really helpful for monitoring what is on their Chromebook screens, especially with prompting some of my more distractible students. I have far less classroom management issues. Obviously, this could be so for a lot of reasons but a big one is that it is easier for me to be consistent. Consistency has always been my classroom management struggle and more flexibility has actually helped because I had to establish clear expectations for it to work. Whenever I jump into the deep end of some big change in my classroom, it is because I want to see all of the pros and cons up front. I try to stick it out the whole school year and then make necessary adjustments the next year. This attitude is not for everyone and certainly it is not any better than those who implement change one step at a time, but it works for me. I still use standards-based grading. I have edited my original system over the years but would never go back. I am half paperless this year. I found out last year that I love having students keep their notes digital through the scaffolded “packets” I create in Google Slides. Working practice problems digitally was a little harder so I switched those back to paper. I am 1 week into a deskless classroom, there is no end in sight but lots of dreams for future furniture! Are you trying anything new in your classroom this year? First off, I love the idea- please make sure we get an update later in the year. Second, could you elaborate by what you mean by "their team’s box by their lab station"? More photos might be helpful. Lastly, you said that you made this decision after doing plenty of research, and I'm sure I could recreate it, but any recommendded reading from your research? Great question about the bins! I thought you could see them in the picture but you really can't! They are just big rubbermaid totes that I have students throw their stuff in. Sometimes they overflow onto the counter but as long as everything is out of the way, I do not care too much. Thanks, I can't wait to check them out. And again, I would love an update later in the year. For sure! If you are on Twitter, I am trying to keep up with my 180 blog this year for my Physical Science class and I will post updates there.